Read more about Frozen Pipes in Hagerstown! This morning, bitter cold temperatures have been breaking records and freezing pipes across the eastern United States. Extreme cold and below-zero windchill factors have been gripping the area recently and will continue into the weekend, with snow added as a bonus. For us, this means lots of frozen pipe calls. We have been receiving a huge influx of callers reporting frozen pipes, making it quite interesting to manage them all. In one afternoon, we received over 50 calls about frozen pipes alone! In this weather, frozen pipes are a serious concern, especially in under-insulated walls, attics, crawl spaces, and basements. So, what can be done to prevent frozen pipes in freezing winter weather and safely thaw them if they do freeze? We’re going to tell you! If you end up leaving your house for any reason, make sure that your heat is on and the thermostat is set to at least, 55°F. Don’t worry about the higher heating bill; a burst pipe is much more expensive. Unhook and drain all outdoor hoses and store them. Disconnecting the hose will prevent damage to the pipe or faucet it is attached to. Keep your outside faucet open to relieve pressure and allow any water to escape. Unhook and drain your sprinkler and swimming pool systems as well. Open all of your cabinet doors in your bathroom and kitchen in order to circulate warm air around your pipes. If the outside temperature is consistently freezing, open up all of your faucets a little bit to allow warm water to slowly drip. This little trickle relieves pressure on your pipes and keeps them from freezing. Consider purchasing pipe insulation to keep your pipes dry and prevent cold air from hitting them. This alone will not prevent frozen pipes, but it will certainly help. Both hot and cold water pipes should be insulated. Follow the manufacturer’s instructions, making sure the insulation is tight and joints are taped. Your local hardware store will also have something called “heat tape,” which uses electricity (make sure to plug into GFCI outlet) to insulate and heat your pipes. Keep your garage door closed, especially if there are water pipes in there. 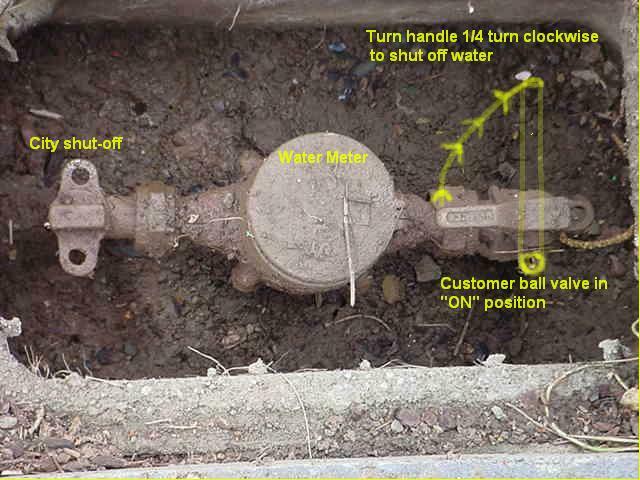 Do yourself a favor and find your main water shut-off valve now! In the basement, near the front of the house. If house is located on a slab, check near your water heater or garage. If you have looked around your water heater, basement, and garage, but still can’t find the water meter, you’ll need to take a trip outside. If you still can’t find your main water shut-off, give your trusted local plumber a call! If you have located the main shut-off valve, congratulations! To turn the water off, simply follow the old adage, “Righty tighty, lefty loosey.” If you have a ball valve, turn it so that it is perpendicular to the pipe. A gate valvev should simply be tightened to the right (clockwise). If you cannot turn the valve, do not force it! Either spray some WD-40 on it and let it sit for a little or call your plumber. Once you have turned off the water, the needle indicator on your meter should have stopped moving, indicating that the water was successfully shut off. You go to turn on the water and nothing comes out. Looks like you have a frozen pipe somewhere in your house. WARNING: DO NOT USE AN OPEN FLAME TO THAW PIPES!! In the event that you are too late and the frozen pipe has already caused a rupture, go and turn off your main water valve!! In most cases, however, the pipe is just blocked. Leave the faucet open. In fact, open all of your faucets a little bit on warm. When you are thawing your pipes the incoming water will help with the process and you’ll be able to tell if your pipes are thawing if water begins to flow. Locate your frozen pipe. This may be difficult since some pipes are impossible to reach, located behind walls, floors, or ceilings. Open up your bathroom and kitchen cabinets first. Most likely, the frozen pipe will be located near an exterior wall. Once you have found the frozen section of pipe, use an electric heating pad, portable space heater, or the more popular electric hair dryer. You can also use towels that have been soaked in hot water. If you have electric heat tape, you can also use that. DO NOT USE AN OPEN FLAME! YOU MAY JUST BURST THE PIPE THAT WAY, IN ADDITION TO OTHER RISKS. Apply heat until you begin to see water flowing in your pipes again . If you cannot locate the frozen pipe, call your plumber right away!! Check all of your faucets to see if water is running. you may have more than one frozen pipe. For frozen drain pipes, pour hot water down the drain until all the ice has melted. For a recap, watch this video. 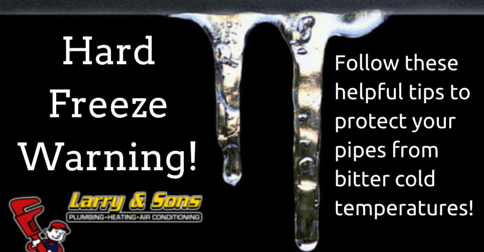 And remember, basic prevention like insulating your pipes is absolutely necessary in these freezing temperatures! If you need help finding your main water shut-off or thawing your frozen pipes, give Larry & Sons a call at 301-733-5428.